How bad are things? 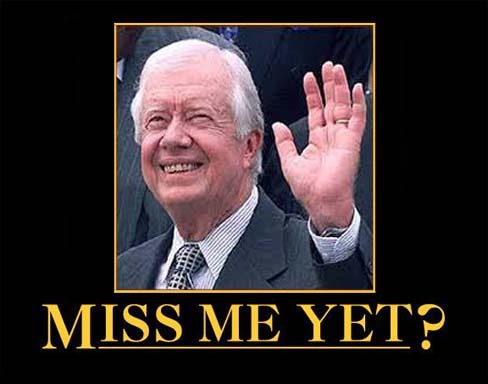 Bad enough that Jimmy Carter, the president who hid in the Rose Garden for over a year while he dithered as to what to do about the American hostages being held in Iran, has accused president Obama of being indecisive in his approach to handling ISIS. Carter acknowledged that the ISIS situation is complicated and he thinks the U.S. waited too long to respond. “First of all, we waited too long. We let the Islamic state build up its money, capability and strength and weapons while it was still in Syria,” he said. He then goes on to remark about how we will need boots on the ground to retake the territory ISIS has overrun. It is unclear if he thinks those boots should be American ones or if he thinks the Iraqis can handle it. But I guess the obvious point everyone is making is that there doesn’t seem to be anyone at the helm.